Typically, music award ceremonies are slickly choreographed – down to the presenters’ spontaneous jokes. But not The Age Music Victoria Awards (The Age MVA), attended by musicians, industry and fortunate public guests. The annual event, which music journo Patrick Donovan launched 13 years ago, traditionally celebrates Victoria’s music heritage consciously yet casually. In 2018, The Age MVA – now part of Melbourne Music Week – upsized from the atmospheric nightclub 170 Russell to the glamorously haughty Melbourne Recital Centre. But it hasn’t lost any grassroots charm. The awards had an unofficial dress code of “smart casual”, but M-Town keeps it rock ‘n’ roll. In fact, the sole letdown was the large number of empty seats in an ostensibly ‘full house’ – especially with such buzz names as Sampa The Great, Baker Boy and Mildlife billed to perform. Still, the audience was enthusiastic, if sparse. Following a Welcome To Country, The Age MVA opened with Mildlife jamming out their kosmische house grooves. The evening’s ‘MCs’, Lyndelle Wilkinson, from PBS, and flamboyant DJ Chris Gill, who hosts 3RRR’s Get Down (and owns Northside Records), ensured that proceedings were unpretentious – and efficient. The Victorian Premier Daniel Andrews has backed The Age MVA as an economic investment. And, when his Minister for Creative Industries, Martin Foley, spoke, he cannily turned it into an electoral opportunity. Foley announced a 10-day festival, Victoria Live, to kick off in winter 2020. The MP also sub-dissed the conservative NSW Government for cracking down on Sydney’s nightlife and festivals. The Age MVA has categories that are determined by the industry (primarily relating to specialist genres), as well as ones for which the public vote (like the prestigious Best Album award). As organisers, Music Victoria has committed to fostering gender balance, with quotas for long lists, and cultural diversity. The Age MVA covers artists, venues and festivals – and, not being Melbourne-centric, regional hubs. This year, it even introduced some categories – most notably Best Solo Artist, which, in replacing the Best Male and Female Artist awards, is inclusive of gender non-conforming creatives. Ultimately, the many brackets demonstrate the scope of Victoria’s music culture – the night’s first award, Best Experimental/Avant Garde Act, going to sound designer Nat Grant. The Age MVA produced several triumphs. The Zambian-born poet, MC and singer Sampa The Great was one of the key winners, taking both Best Hip Hop Act and Best Soul, Funk, RNB And Gospel Album (with Birds And The BEE9, which dropped on the Ninja Tune offshoot Big Dada late last year). The young Indigenous dancer, musician and rapper Baker Boy (aka Danzal Baker), definitely the star of the red carpet in his fly suit, won Best Male Musician, Best Live Act, Best Breakthrough Act, and Best Song (for ‘Marryuna’). Baker gave successive endearing speeches and, symbolically, spoke in his Yolngu Matha tongue. The staunchly indie Courtney Barnett is currently touring the UK behind her second album, Tell Me How You Really Feel, and so couldn’t appear. But she nabbed Best Female Musician, Best Solo Artist, and Best Album – the later of which now comes with a $10,000 cash prize, courtesy of the Premier. The seasoned band Collard Greens & Gravy collected Best Blues Album for Luedella, with an emotional Ian Collard revealing how he nearly quit when in 2016 their guitarist James Bridges succumbed to cancer. The producer Monkey Marc, formerly of the hip-hop posse Combat Wombat, took the new Best Reggae & Dancehall Act award. Those critics’ darlings Mildlife scored Best Electronic Act. As for the surprises? Little Ugly Girls bagged the inaugural Best Rock/Punk Album over the much-lauded Camp Cope. Led by Linda Johnston, Little Ugly Girls formed in the ’90s – but, astonishingly, only released their debut album in August. Nonetheless, Camp Cope did win Best Band, the trio giving a jokey speech. Also new this year was the Archie Roach Foundation Award For Emerging Talent, superseding the Best Aboriginal Act category – and bestowed by the singer/songwriter himself. The MC/vocalist KAIIT won over a tight field of nominees like Alice Skye, Baker Boy and Willow Beats, who, ironically, confirmed an indefinite hiatus in May. Sadly, KAIIT was a no-show, due to illness. Inevitably, The Age MVA presented stellar performances. Pikelet founder Evelyn Ida Morris offered a cerebral composition on piano. Known as the Fresh New Prince of Arnhem Land, Baker Boy brought the energy with ‘Marryuna’. Accompanied by a deadly band and dancers, he played the yidaki (didgeridoo) between busting moves. And, in a sequence worthy of the Grammys, Sampa staged a lavish rendition of ‘Bye River’ with a full band and gospel choir – all celestially attired. An ‘In Memoriam’ paid tribute to, among others, the AC/DC guitarist Malcolm Young, champion turntablist DJ Kuya (Arsenio Fabay), and Earthcore promoter Spiro Boursine. Lastly, the late Chrissy Amphlett was inducted into The Age MVA Hall of Fame, joining legendary music tastemaker Molly Meldrum in September. The Divinyls vocalist already has a Melbourne lane named in her honour (curiously, in proximity to Birrarung Marr, where her band fulfilled their final Melbourne gig at the Hot Barbeque dance festival on New Year’s Day in 2008). The ’60s pop star Little Pattie, Amphlett’s cousin, shared personal stories. 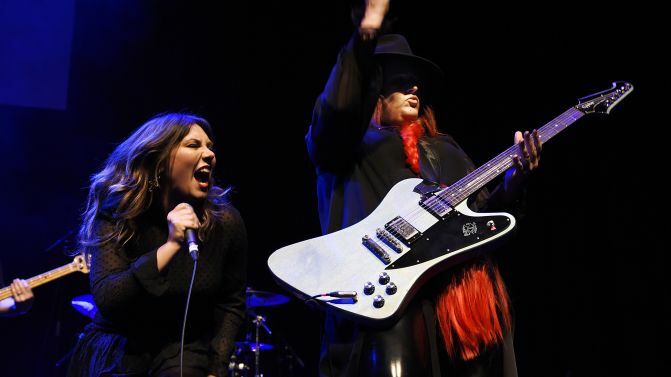 Killing Heidi’s Ella Hooper then teamed with Dallas Frasca for a rousing cover of the New Wave ‘Boys In Town’ – the crowd fully letting loose.